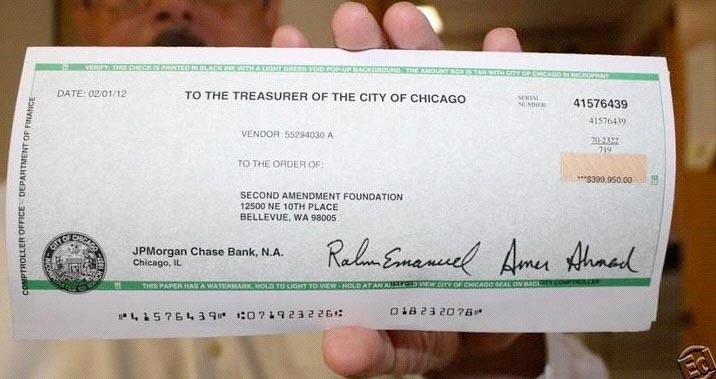 The District Court has denied an award of attorney fees in NRA v. Oak Park & Chicago. Text is in extended remarks below. The grounds are that after the Supreme Court ruled in McDonald v. Chicago, Oak Park revoked its ban and Chicago replaced its with a new ordinance. When the Supreme Court sent the case back to the 7th Circuit, the Circuit ordered the trial court to dismiss the case as moot. The District Court rules that NRA did not "prevail." Don't have time to look up all the case law, but I really doubt the ruling would have been the same if plaintiff had been a more favored party and the suit a more favored cause of action. Continue reading "Atty fees denied in NRA v. Oak Park"
Opinion here. 240 pages if you count the concurrences and the dissents. A wonderful day! Everyone gets something. Alan Gura gets Thomas' concurrence, and the fifth vote. Steve Halbrook gets cited a zillion times (as I've said before, if you could copyright an argument, the Supreme Court would have had to negotiate royalties with him). I get cited by majority and the concurrence. Professors Wyldenthal, Curtis and Aynes get cited. The Women State Legislors' brief, by Sarah Gervase, Carol Bambery and Linsday Charles, gets cited, too. UPDATE: not to mention Bob Cottrol, Ray Diamond, and Clayton Cramer, who get cited by the majority, the Thomas concurrence, or both. The majority decisively rejects Stevens' argument for "incorporation, but a weaker version applies to the States." Scalia's concurrence stomps all over Stevens' dissent. And, while not addressing standard of review, the Court repeatedly describes the right to bear arms as fundamental. Otis McDonald and Alan Gura after the argument. Mr and Mrs. McDonald coming down the steps. and the Second Amendment Foundation’s reception that evening. Here's the story. Interesting. Lead plaintiff, Otis McDonald, is a 76 year old grandfather and lives with his wife in a risky neighborhood. He's been burglarized repeatedly and once threatened with death. He has shotguns, but can't keep them on the nightstand when he turns in. All in all, the perfect person to be bringing a 2nd and 14th Amendment challenge. Here he takes on the historians' amicus, with a promise of more to follow, and here he deals with the amici's treatment of State bills of rights. Pdf is here. Reading it now. Thoughts after a quick read: stylistically, well-written. The argument against due process incorporation involves taking what the Court has said and not what the Court has done. The Court has said that "fundamental rights" are something of a narrow class of rights ... rights without which there is liberty or civilization. But what it did while so saying was to rule fundamental almost all the rest of the bill of rights, and unincorporated rights such as the rights to contraception, abortion, and gay relationships. I think we can say that there can be liberty and civilization without, oh, jury trial for major misdemeanors, the right to buy condoms, the right to an appointed attorney. For that matter, with an established church, such as in England, and the right of the prosecution to move for a new trial based on legal errors. I vastly prefer living in THIS civilization and with THESE freedoms, but I can envision a liberty and civilization without them. With regard privileges or immunities incorporation, it's right what we could expect. (1) Don't overrule 100+ years of case law and (2) OK, so there are quite a few mentions in 1866-68 of p or i enforcing the bill of rights, but they're not enough and not clear enough for our tastes. With a dash of (3) if you incorporate via p or i (AND use it to abandon rather than supplement due process incorporation) then you have to withdraw all bill of rights protections from corporations and aliens, since they may be "persons," but are not "citizens." His commentary on the Congressional brief, on the Institute for Justice brief, of our brief for Academics for the Second Amendment, and the Cato Institute brief. Plaintiffs have filed a motion for summary judgment (pdf). As they're subject to a page limit of 15 pages, it can't be a treatise. But the critical points are made, and the style excellent. A person without a legal background can read and reasonably well understand it, which for a technical issue like 14th amendment incorporation, is hard to do. On the side, they're giving the city flak about its answer to the complaint. UPDATE: the odds of winning in the District Court are about zero, and appellate court not high. As I see it, the only likely win is in the Supreme Court, should it take the case. The trial court (even if not part of the Daley Machine) is going to answer "maybe you're right, but the Circuit Court of Appeals has said it's not incorporated against the States, and I can't overrule the Circuit." The Circuit would *probably* respond "maybe you're right, but (1) we've held previously that it wasn't incorporated and (2) a century ago the Supreme Court did the same (albeit under the earlier "privileges or immunities" approach only), and we can't overrule the Supreme Court." Then you go to the Supremes and see if they'll decide the issue.